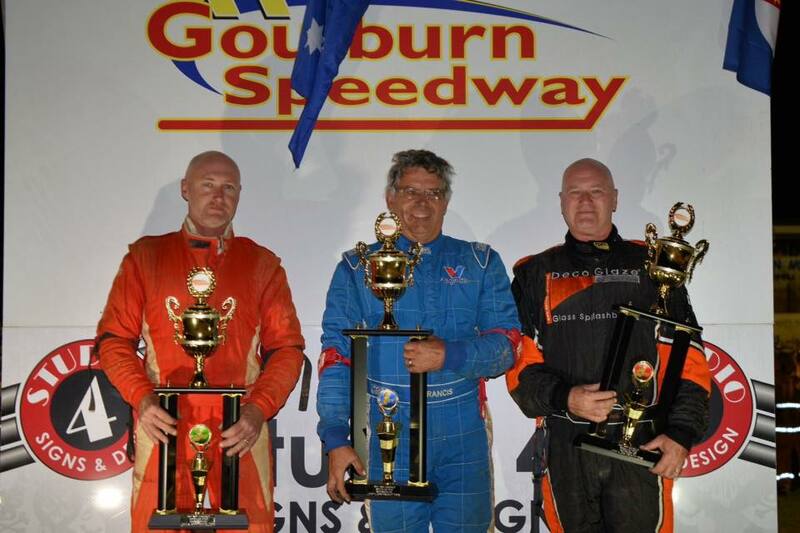 Rod Francis claimed his second NSW Compact Speedcar Title last night at Goulburn Speedway leading from green to checkers after qualifying off pole for the 20 lap MOTOGENN supported final. It was not an easy win for Francis by any means with another former state champ, Rob Eyeington, right on his tail for the full distance. Eyeington had started outside Francis as 2nd highest point scorer. Mark Heaton had to do it the hard way after being relegated to the rear after an early race incident that saw Victorian champ, Justin Paull ride out a massive end for end roll down the front straight. Heaton passed Alan Day on the last lap to claim third spot on the podium. Justin Paull’s ventures to Goulburn haven’t been kind, but back in the pits after the final he made it quite clear that this track wasn’t going to get the better of him and he is determined to come back and “beat this place”. With the weather throwing up all sorts of challenges in the lead up to this meeting the track was in surprisingly great shape for the first round of heats. Craig Hickey made his intentions clear with an all the way, comfortable win in heat one. Stewart Henderson was under no pressure claiming 2nd with Bruce Adams getting quicker by the meeting placing 3rd. Steve Zarb brought on the yellows after 3 laps into heat 2 after driving head long into the turn 2 wall. The car sustained enough damage to put him out for the night. When the race resumed it was Mark Heaton assuming the front running holding out a fast finishing Rob Eyeington and Rod Francis to take the win. Rod Francis made some minor changes to the number 4 machine for the 3rd heat and set a blistering pace out front taking the black and white easily ahead of Mark Heaton and Dan Biner. As the 98 machine of Rob Eyeington drove under the checkered flag there were simultaneous accidents at opposite ends of the track. Craig Hickey hit the turn 3 – 4 wall and rolled while in turn 2 Brad Forgard rode a wheel and had a ride on the wild side. Alan Day placed 2nd with Bruce Adams given 3rd. Forgard was attended by the ambos back in the pits with a suspected broken collar bone. Hickeys night was also over with too much damage to make a return. Justin Paull had a disappointing start to the night breaking a throttle cable in his first heat and the repairs made not making it thru his second heat. He recovered strongly winning heat 5 by about 50 metres over Dan Biner and Rod Burns. The final heat and Rod Francis bagged his second heat win to top the points going into the final. Rob Eyeington chased hard but couldn’t get close enough to the winner and had to settle for second. Alan Day was again consistent in placing 3rd. The NSW Compact Speedcar Club would like to thank MOTOGENN who’s valuable sponsorship of this meeting is greatly appreciated. Thanks to the Saville clan for the BBQ at the end of the night. To all the volunteers and officials a special thanks, without you all this would not happen.